I'm a huge fan of both the book and movies from the, Twilight series. Although the first year I was in denial and would not go and see the movie or read the books, I finally gave in and was instantly addicted. So naturally after all the movies were out and on DVD I decided to let my daughter watch the series with me. 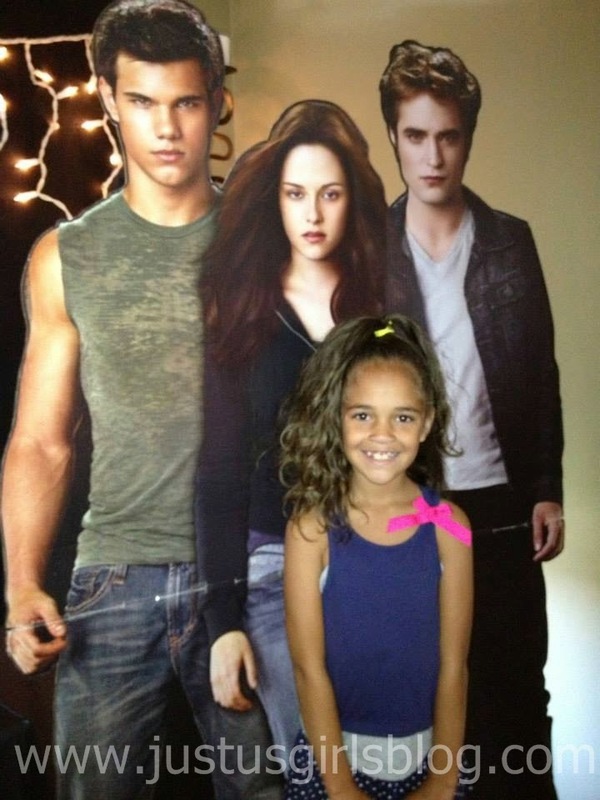 She loved it and wanted to celebrate Twilight style for her 8th birthday. 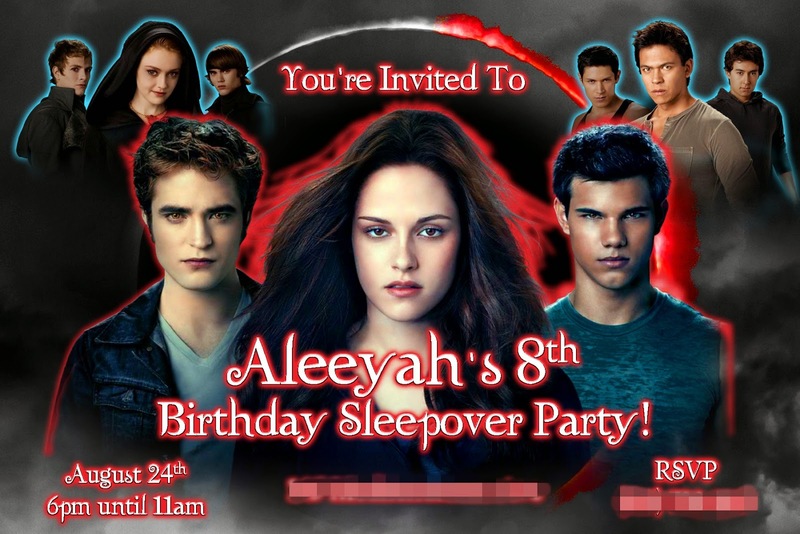 Knowing that her birthday was at the end of Summer, there wasn't much out there in stores for party decor, especially since it had been a while since Breaking Dawn Part 2 came out on DVD, so I had to do some online digging and was pretty amazed by the turn out. 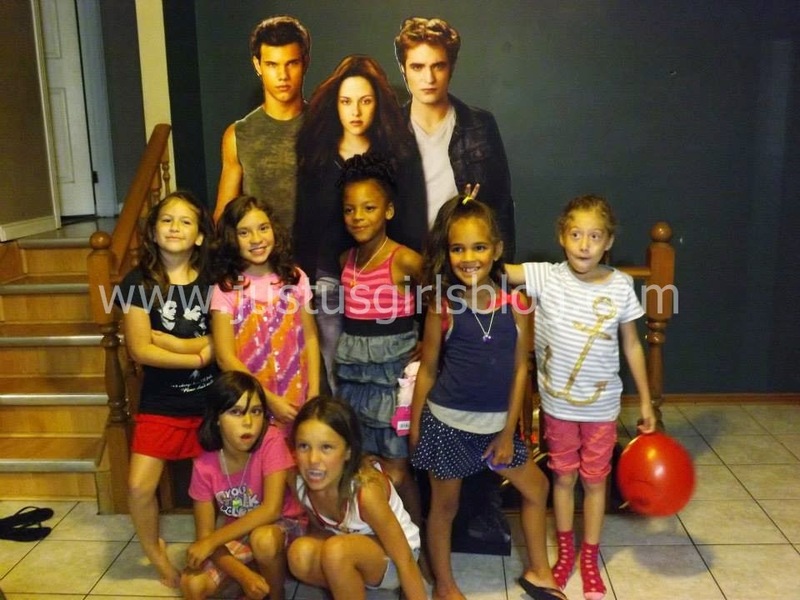 This was suppose to be shared with you all on the blog last Summer, after her party, but things happen and hey, just in case you have a little girl in your life or you yourself want to throw a Twilight party, you can, any time without store decorations. My inspiration from the decorations came from Pinterest, Youtube, Flickr, many different blogs and I loved how it turned out. First was the invitations, we went with Design Strategy, a shop on Ebay, since we couldn't find any invitations at any party store and then I had Costco print them out on photo paper. I absolutely love how they look and how they were customized and it wasn't expensive at all. 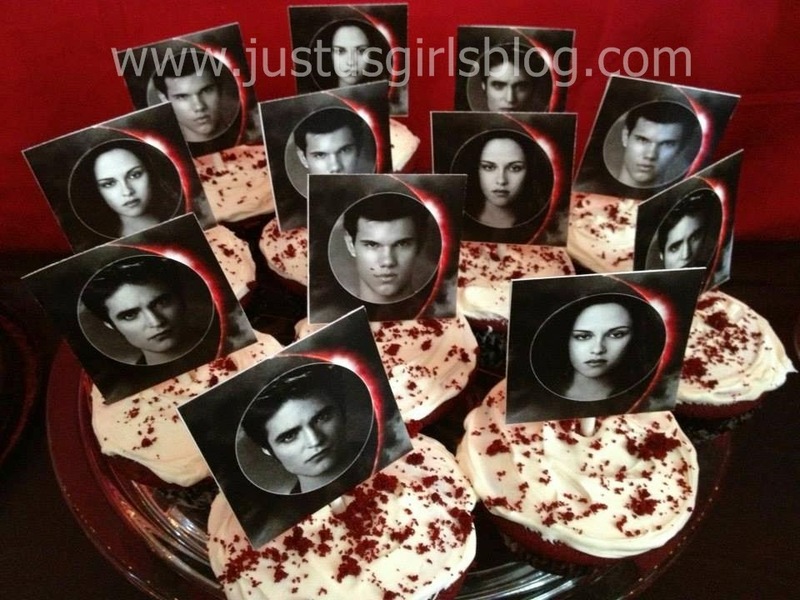 The main part was making sure that Bella, Edward and Jacob made it to the party. 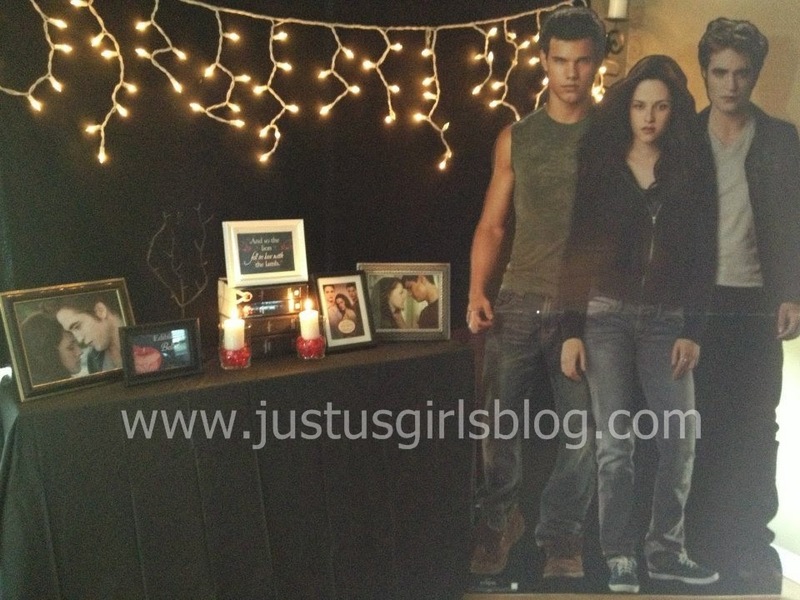 I found life size cut outs of all three of them from Movie Cut Outs on Amazon and was glad that this was a huge hit with all the girls. I even got a bit fan-girlish and was excited when they arrived. I created a sign to welcome the girls when they first arrived that I found from a previous Twilight party I seen on Flickr. It was a sign that said, "For Your Saftey, Prior To Entering Please Make Sure All Paper Cuts Are Covered With A Band-aid. 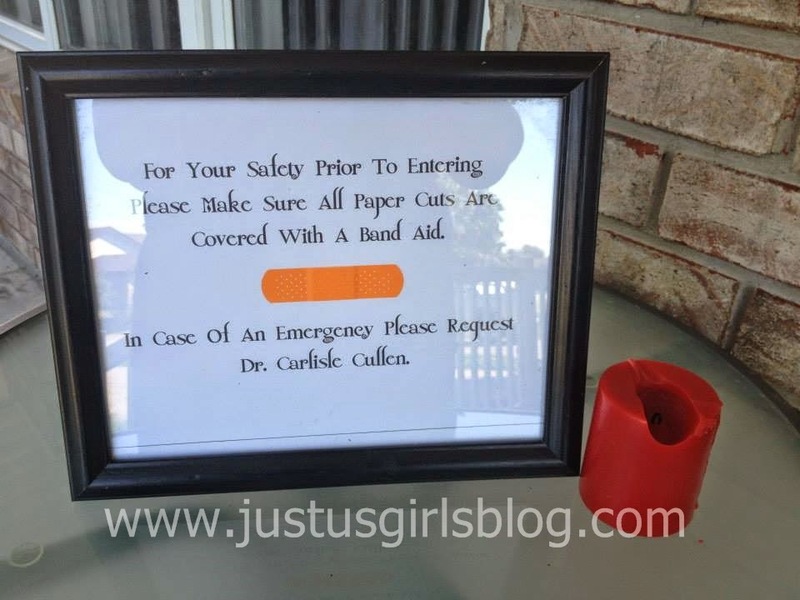 In Case Of An Emergency Please Request Dr. Carilise Cullen." Next was making sure that I had decorations. I ran into a bit of luck and headed to the clearance bins at Party City and we found Twilight napkins and then went to our local thrift store where I found an old calender that had great pictures from Eclipse. Dollar Tree even had a few Twilight birthday cards that I ended up framing along with some of the pictures from the calender. Thank goodness for Hostess With The Mostess, she had and still has on her blog a ton of print outs for you to frame, have for drink and food labels and so much more. 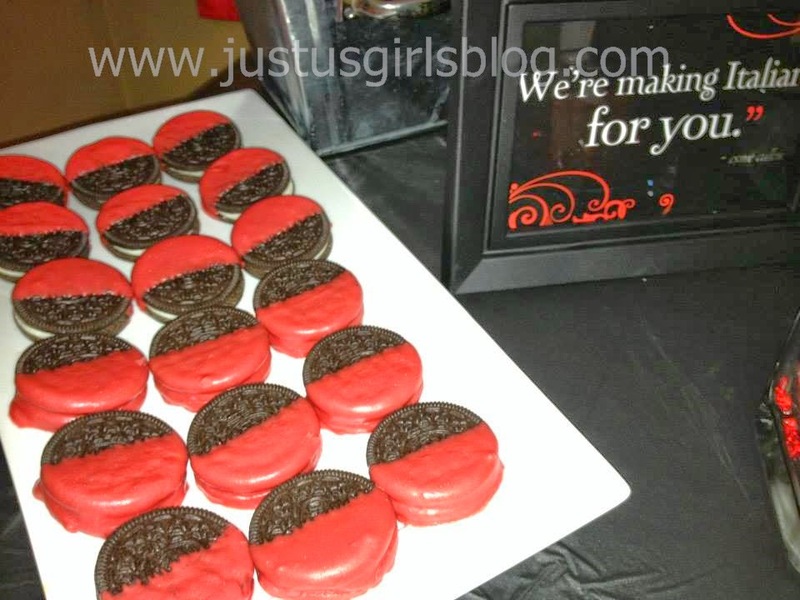 I was super excited because this helped with our food table and made the theme of the party much more beautiful. 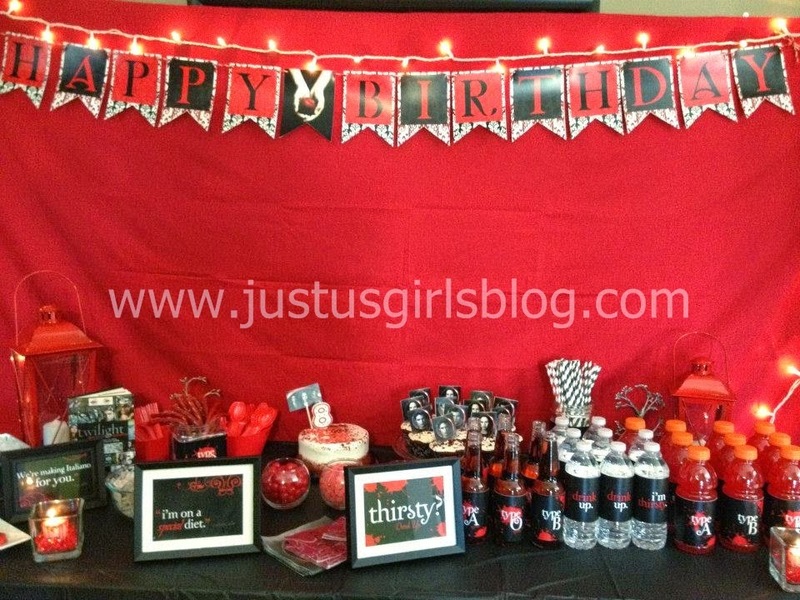 The banner was purchased from a lovely shop, OMG Candies and Events on Etsy. They sell a themed Twilight package, but was nice enough to sell me just the banner by itself. The Red Lanterns, which made the table look even more beautiful were from Oriental Trading and worked so well. The lanterns along with the white lights and candles made the room look so nice once the lights were all off in the room. 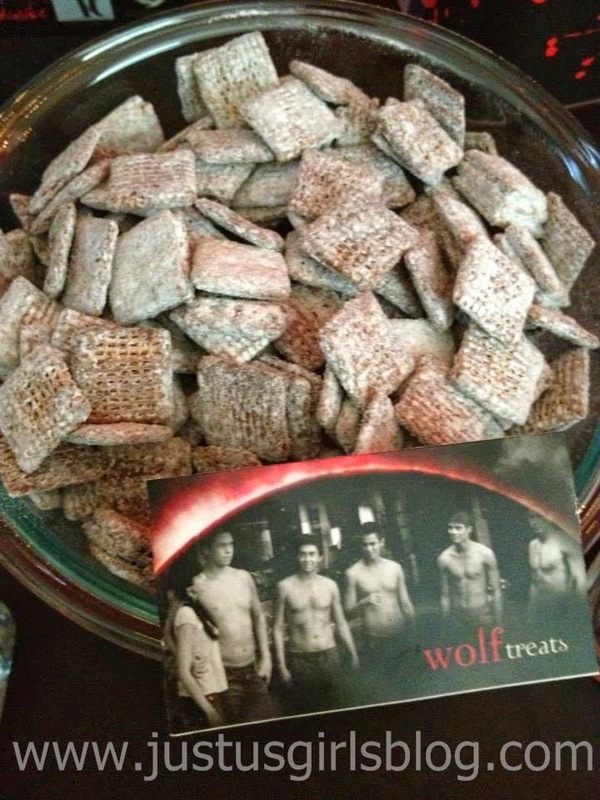 For food I served the girls pizza and salad and we had some delicious treats, like, Bloody Oreos, Werewolf Treats (Puppy Chow), cupcakes, cake and lots of red candy, which the girls loved. I got my black and red paper straws from Greenmunch. The girls loved adding them to their drinks. Since my daughter's birthday is at the end of August, I went to our local Dollarama for decorations and they had a few Halloween table covers, like, the spideweb mesh. 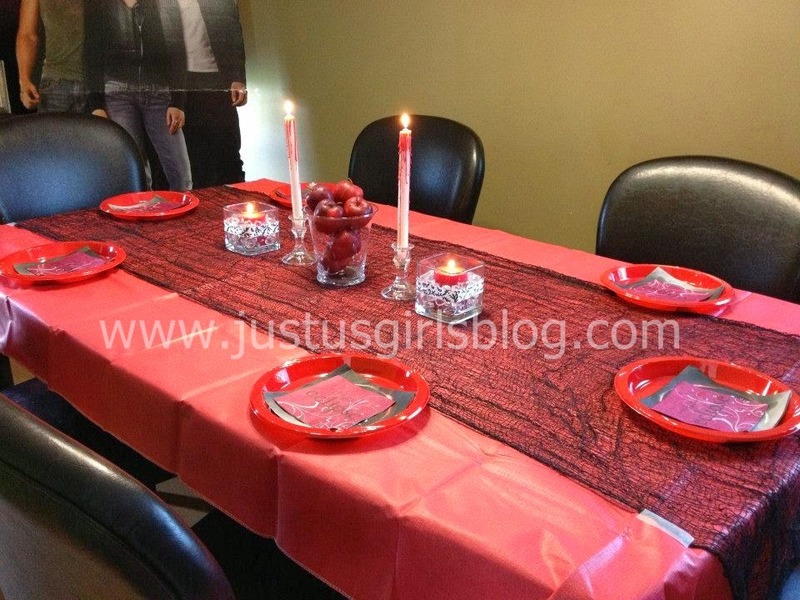 You can't have a Twilight party without red apples, this made for a great center piece along with bloody candles. Once all the decorations and props were up and down, it was then time for me to get the grab bags ready for the girls. 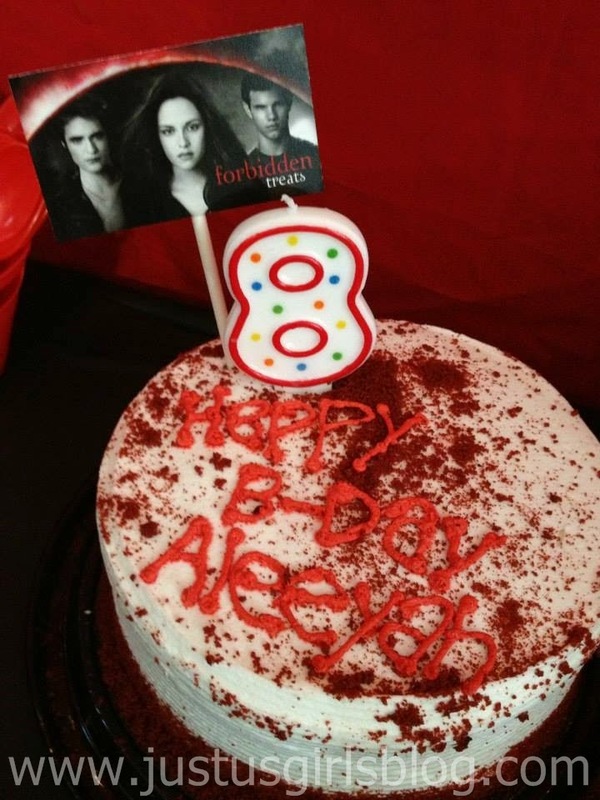 I got Black Tote Bags and inside the bags were Twilight bookmarks that I had made using an image online, Glow in the Dark Vampire Fangs, Breaking Dawn Buttons, red chap-stick, red nail polish and some candy. 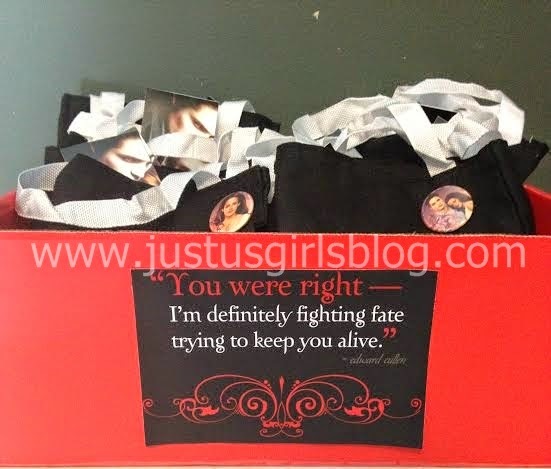 Once the bags were put together I put them in a box and added a quote from the movie and they were ready to give to the girls when they were leaving to go home. During the party the girls had fun with karaoke, getting their nails and makeup done, jumping on our trampoline outside and making friendship bracelets. Once the sun started going down and dinner, presents and ice cream and cake were all done, I let the girls pick which Twilight movie they wanted to watch and they grabbed their blankets and pillows, laid in our family room munching on popcorn and treats as they watched the movies. This was definitely a party I was proud of and my daughter absolutely loved. 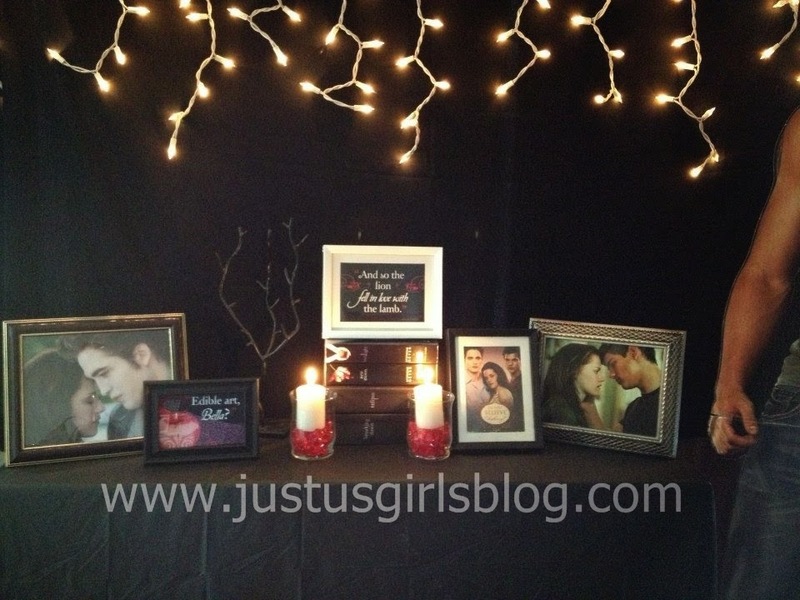 If you're looking for a Twilight themed party, I hope you get inspired by the pictures I've shared with you. Disclosure: All opinions are my own. I received items from Oriental Trading at no cost for the purpose of sharing this party. No other compensation was received.